Daegokcheon Stream Petroglyphs is part of the Tentative list of Republic of Korea in order to qualify for inclusion in the World Heritage List. a. The museum was opened in 2008 and is a fine example of the money and effort which S Korea is prepared to spend on providing Musea at its (T)WHS sites (and maybe at others too?) Designed in an elongated “sinuous” shape it is meant to represent the Whales which figure on the Bangudae carvings and an, otherwise architecturally unnecessary, “Tail” has been affixed to one end of the roof of the building to assist this representation! b. We were almost the only visitors present in mid week early afternoon and were provided with literature in English by the 3 staff – who spoke no English, making it a bit difficult for me to establish which of the 2 rock carvings might be the better to concentrate on if we didn’t have time to visit both! We were ushered into a plush cinema and shown a video with English dubbing. Part of this showed the museum’s opening ceremony attended by hordes of besuited “executives” – Unfortunately I missed catching the exact figure given on how many millions (trillions?) of Won the whole thing cost. c. The museum does indeed contain good fibreglass replicas of the 2 rock faces and that for Bangudae is worth examining in detail since the later views of the real thing are very limited. The claim is that the representations (created from late Neolithic to the early Bronze age – 7000-3500 ybp) “include the oldest drawing of whale hunting in the World” and that several different species of Whale can be identified (Grey, Humpback, N Right, Sperm, Killer). 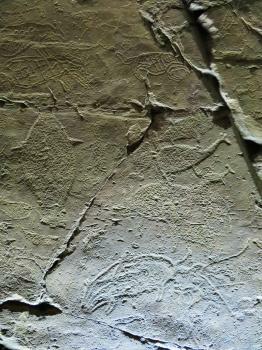 There are also carvings of other animals, humans (including “shaman” figures) and tools such as nets, harpoons etc. We didn’t spend much time on the rest of the museum which was about general Korean pre-history and petroglyphs worldwide. Nor did we avail ourselves of the QR code presentations which “cause an animated character to appear on (your) tablet to explain something about the prehistoric age…for example….primitive men pop up and pretend to draw on the rocks”! d. We managed to establish that it was possible to drive closer to both sets of petroglyphs rather than walking the 1.2kms each way (in opposite directions for each) from the museum and, with this time saving, decided to take in both. Bangudae is reached by crossing the bridge next to the museum and driving on a very narrow road (stay with it!) around 1 km until you reach a restaurant – there is a boardwalk/path from there though a bamboo grove to an open area around 70 metres from the rock face. We had passed a guide going the other way as we walked towards the rock but she hadn’t offered to go back with us and we were the only people present at the viewing point. Climbing over a locked gate would have allowed us to get closer and I don’t think a guide would have opened it – even with telescope/binoculars it was very difficult to make out much from that distance and the light wasn’t ideal – a boar and a whale (of unknown species!) were indeed decipherable and are visible in my photos when enhanced by Photoshop – but not good enough to upload here so I have provided a photo of the replica of the Cheonjeon-ri petroglyphs) Having been there and read more it becomes clear that the Bangudai petroglyphs are, for as much as 6 mths pa, at least partially, underwater because of rises in the levels of the nearby lake created by the Saeyon dam which backs up into the river valley (the area was dry in March 2017). The viewing point has therefore been placed far enough back to avoid such rises. Rather surprisingly the Petroglyphs were only discovered in 1971 (which provides an indication perhaps of how (in)visible they are!) and the dam construction commenced in 1961.
e. The Cheonjeon-ri petroglyphs are reachable by road along a roundabout route which requires a return to the Busan-Gyeongju road, going 1 “block” north along the old highway and then back into the mountains following the signs towards the Ulsan Daegok Museum (Yes - yet another which apparently contains archaeological remains rescued from the dam/lake area!!) but keeping right where possible. A 200m walk crosses a small stream by ford/low bridge to the rock face. This contains petroglyphs from 2 different periods. First, as with Mangudae the Neolithic/Bronze ages - but, unlike Mangudae, these have very few visible “animals” and a lot of geometric patterns. Generally they are less interesting than the Bangudae ones (if you could see those!!) but are very easy to view as a viewing platform has been provided alongside them, together with good explanations in Korean/English. The second set of “Petroglyphs” are in fact inscriptions from the 6th C AD in the time of adoption of Buddhism by King Beopheung and record such matters as Royal Visits to the spot. As the previous reviewer indicates, access to this area could be problematic in times of heavy rain. f. It would seem the Korea might be flogging a dead horse in trying to get this site inscribed. As we know, there are already a lot of Petroglyph WHS and plenty of others queuing up on the T List. It does appear that ICOMOS are prepared to regard petroglyphs from different geographical/cultural areas as providing “unique” OUV and the Whaling aspects of Bangudae might provide this. But that dam remains a problem! Apparently the Korean “Cultural Heritage Agency” pushed for the water level of the dam to be reduced but Ulsan City said that it needed the drinking water! The latest idea was a “Kinetic dam” in Steel and transparent plastic around the rock which could be raised/lowered according to water levels and would let in light to prevent moss build up. The most recent report I can find is this dated Jun 2013 “I hope the Bangudae Petroglyphs are preserved as a precious asset of the world," Prime Minister Chung Hong-won said during their signing ceremony for a memorandum of understanding to push for the new preservation measures.” – the same report talked of nomination by 2017 (and it is on our “possible” list for 2018 having been postponed from 2017, which would mean that it would already have to have been submitted. Of the propsed “kinetic dam” there was no sign)!! I don’t see the Cheonjeon-ri ones as having any OUV. g. The visit to the museum and both locations must have taken around 90+ minutes. The sights themselves were not really worth it – though the whaling aspects were an interesting “find”. With a car we arrived early pm and still had time to drive on to see Seokguram but wouldn’t have had time to see Bulgaksa as well. On the first day of July, early afternoon, rain pouring, we arrived at Ulsan Petroglyphs Museum. Once I entered the museum (in part as shelter), I was immediately impressed. This history lesson will be different than most museums or historic sites in Korea. Nothing about Confucianism, Buddhism, seowon, fortresses, or tombs! 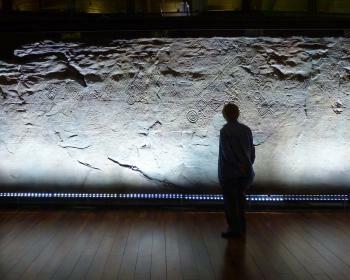 The museum really is fantastic, sure not much is in English, but the replica copies of both petroglyphs are superb. The video in the small theater is informative and quite dramatic, some English. The museum is where you should start, it probably takes 30 to 45 minutes. After the museum you have two choices. Because of the heavy rain and a warning that Cheonjeon-ri in this rain could be dangerous, the museum staff recommended the short hike to Bangudae Cliff. The walk is very pleasant, and quite scenic along the Daegokcheon Stream (even a small spot with dinosaur footprints). Once you are in view of Bangudae cliff, there are high zoom installed binoculars. Since you are on the opposite side of the stream, the distance makes seeing the petroglyphs difficult (especially in heavy rain). With my new camera (40X zoom) I could see them fairly well, but high zoom + heavy rain does not equal great pictures. The picture here is from the replica, but several of my pictures were focused on this scene, and with zoom I could make it out with difficulty. Despite the challenges, and partly because of them, Daegokcheon Stream will remain memorable. Its also different than almost any other historic site in Korea. The scenes of whales, and its age of more than 5,000 years is quite unique. However, I have little insight if this site could meet the satisfaction of ICOMOS of not only OUV, but also protection concerns (because of the dam). The dam shield plan failed, and I know of no long-term solution currently. The petroglyphs could disappear almost completely within decades if a solution is not implemented.